The Floating Empire: Okay, so I lied. 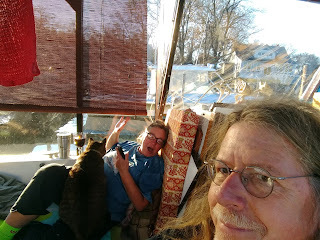 . .
One more little post about dealing with cold. One of the issues with any fiberglass vessel (and this also applies to anything that can't breathe) is, of course, condensation. We've written about this before, and have used a lot of techniques to try and deal with the damp. 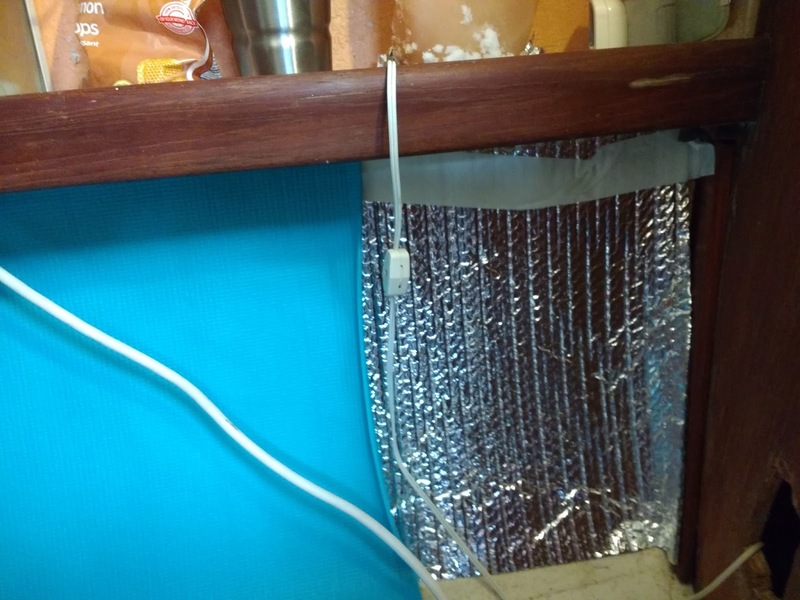 The V berth is a bit of a problem aboard Tesla's Revenge as there's not a lot of space for insulation, and the interior walls can, under some circumstances, get sheets of moisture coming off them. . . .and into the bedding. So in search of something that might work, we returned to our old friend EcoFoil (silver mylar coated bubblewrap). 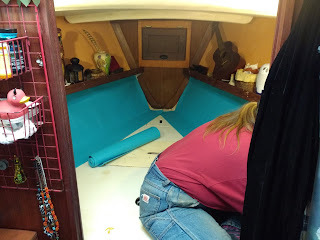 We dried the space as best we could and used a combination of gorilla tape, which will stick to damn near anything, and double sided rug tape to do the sides of the V berth. Not liking the bubble wrap as a surface, we were casting around when we saw these cheap yoga mats at a 5Below for a couple of bucks apiece. So we picked up a few and double stick rug taped them to the EcoFoil. I think you'll agree it looks rather nice. The added insulation hasn't solved the problem entirely, but it has really cut down on the moisture and made the sides of the hull a lot more pleasant to touch with your bare tush in the middle of the night. The enclosed wheelhouse with its clear FlexOGlass sides has proven to be a joy. During the day, we're running some 20 degrees above ambient, and a good clear, windless day can heat the whole boat. Having this space through the winter is going to be just wonderful. If you've been thinking about this kind of enclosure, do it. Note in the above picture we're in shirtsleeves and there's snow on the docks. have you considered using the enclosure as bedroom-sleeping quarters? Hi Ray. Probably not, though in summer when we switch the flexoglass for screening it might be a possibility. As it is, it's a great daytime lounge space, which is frankly something we were lacking.